March started with warming weather, cool clear water, and frequent foggy days. 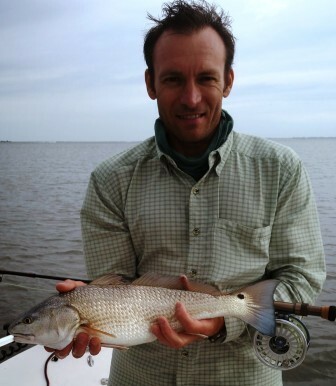 Tim came back to St. Simons for business and managed to squeeze in a day of fishing. Click the image to the right for a video we made of that trip. Most of March and April we fought winds, rain and fresh water. But we had several great trips. Claudiu faced cloudy skies and strong winds. We kept at it, bumping several schools before finding some cooperative puppy drum. Daddy/Daughter days are always special. 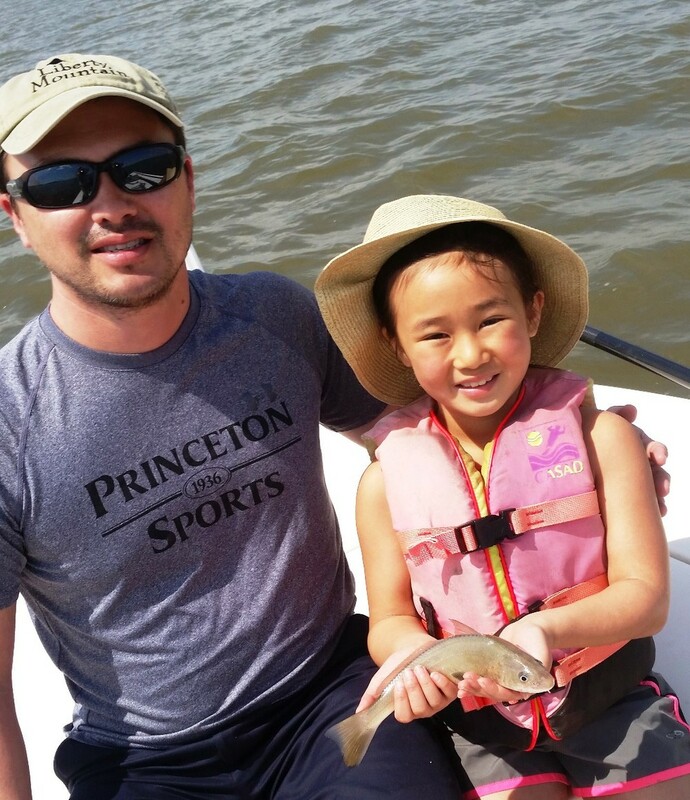 Ryan and Naomi joined me for a few hours of fishing for whiting for Naomi and then a few hours of sight fishing for Daddy. Being on the water with your kids is very special. 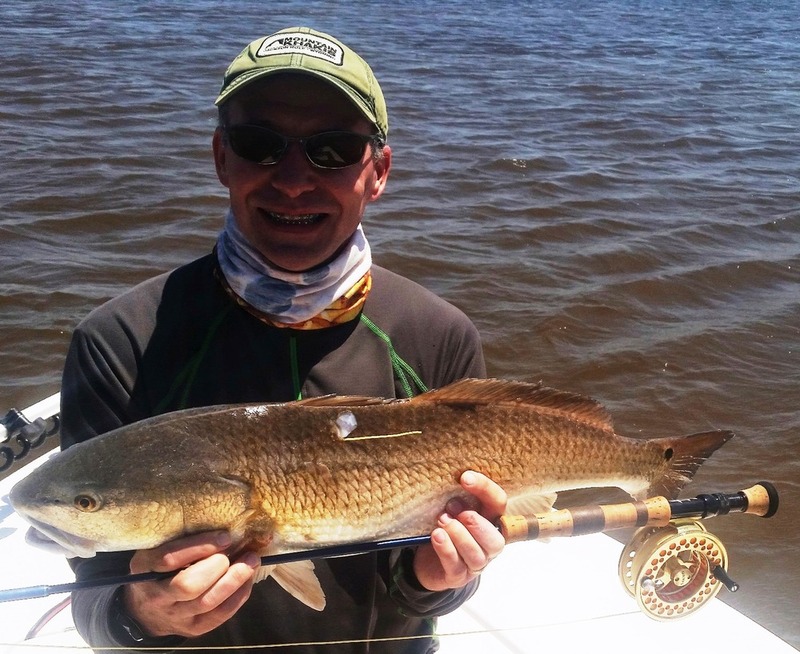 The first picture in this email is a photo of Tim with a 14 lb, 33" red fish he caught the end of April. Here is the 10 lb red he caught a few minutes later. We were fighting wind and dirty water that day. 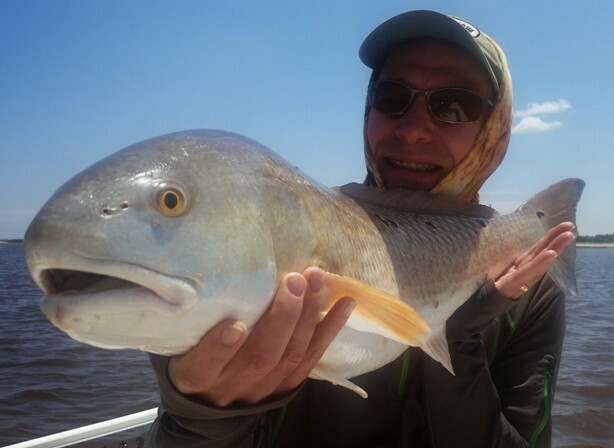 We looked in a few places before we found several Bull Red Fish on an ocean side flat I had not fished in years. They really liked the Chartreuse Chernobyl Flashbang fly that day. Both fish were tagged for the DNR. Orvis encourages customers to leave feedback on their guides. I do my best to make your trip OUTSTANDING. If you feel you cannot rate me well, please let me know, and I will make it right. Please check out my feedback on the Orvis site. Click on the endorse guide logo anywhere on this email. This fly has been working extremely well recently. I developed the Chernobyl Flash Bang flies to have a fly that had the flash and movement of a spoon fly, but was easier to cast. This Chartreuse version and a version with a Speckled Gold Puglisi Sparkle brush with rusty orange rabbit strip work extremely well. Click the photo above to go to my web site for tying instructions.